My first job, at the age of 17, was as a nurse’s aide in a nursing home. Nurses at that time had little white caps with a black ribbon across the top and passed meds in little white paper cups. I did not understand at that time what it meant to be a nurse. However, I was intrigued so I enrolled in a physiology class my first year in college. I sat on the edge of my seat fascinated by the human body and how healthy systems worked. When I enrolled in nursing I learned the devastating effect that disease can have and the critical role nursing plays in helping patients recover or cope with disease conditions. Tell us how you became a CV Nurse. Steps to become a Cardiovascular Nurse began early in my career. I worked on a telemetry floor and then critical care unit with adult patients who had cardiac procedures and heart bypass surgery. The experiences in this area fueled my desire to learn more about cardiovascular nursing. I will never forget the heart surgeon who always took the time to teach. Sometimes he would bring calcified valves or enlarged hearts from patients who did not survive surgery to the unit to show us. I am sure a non-nursing person would think this was bizarre, maybe even sick, but I was hooked. In addition to hospital-based nursing, I had experiences in ER, home health, and my graduate work in preventative cardiology. My nursing journey has led me to my current position as a Heart Failure Clinical Nurse Specialist. When asked to describe a” typical day”, there is never a “typical” day as a heart failure nurse. Some of our patients learn that they have heart failure for the first time. They are frightened and very sick. This can bring a variety of challenges that are unpredictable both clinically and psycho-socially. A typical day involves being prepared, flexible and creative! Anticipating patients’ needs and meeting them even in the simplest ways can have a huge impact. Because heart failure varies dramatically from patient to patient and across the spectrum of disease severity, determining the individuals’ clinic picture and response to therapy can be particularly daunting. In addition, many patients have multiple barriers which can include low health literacy, limited finances to pay for multiple medications, lack of transportation to medical appointments and limited to no social support. Cognitive deficits due to low cardiac output and poor brain profusion can complicate the patient’s ability to remember and process changes in medications and instructions. Helping patients overcome barriers is challenging but also very rewarding. Patients are so grateful for the help they receive from members of our multidisciplinary team. Most rewarding for me is the impact nursing care can have on not just the patient but the whole family support system. I had the wonderful opportunity to care for a young father with a 7-month old son who was seriously injured. He had worked on nuclear submarines and at the time of the injury was a second-year law student. He was in the ICU comatose, his recovery lengthy and his family traveled from the east to west coast frequently. As I got to know the family, I offered our home as a place for them to stay when visiting. Who would have thought, they accepted. It was months before my patient was able to travel to the east coast to be with his family and continue rehab. The time this family spent in my home was wonderful and enriched all of our lives. This past month my young patient passed. It had been almost 18 years since the accident and 10 years since I had contact with the family. When his youngest brother called to give me the news he said that his family could never repay the depth of care provided during that tragic time. What advice would you give to those just starting off in their nursing career? Nursing is a journey where one can continue to develop and grow with life changes. Every experience contributes to a nurse’s personal story. The most valuable piece of advice that I would give to a nurse just starting out in their career is to remember to do what is in the best interest of the patient. This will never fail to guide you through any complex situation or difficult decision. How are you involved with PCNA? I love PCNA. It is a great organization. I use their patient educational tools and PCNA offers wonderful continuing education opportunism. Speakers are outstanding at conferences and the comradery makes for great opportunities to network. 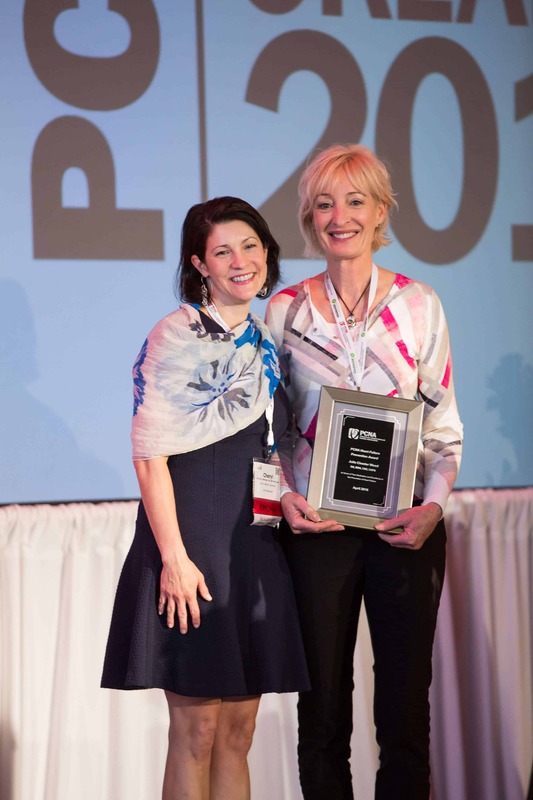 PCNA members are passionate about their practice and inspiring to be around. I have had the opportunity to be a speaker at the learning series this fall. I am also extremely grateful to represent PCNA as the recipient of the Prevent Heart Failure Award this year.